In the real world we find curious phenomena, which are undeniably real and yet possess an element of irreality. This may sound paradoxical, but everyone is familiar with such things, only we do not usually describe them in such a complicated and abstract way. By this I simply mean objectively existing images. For example a tree at the edge of a lake is reflected in the surface of the water. Reflections, too, belong to the conditions under which real things exist in a light-filled environment. Objects before a light cast shadows, trees at the edge of a lake are reflected in the water, smooth polished metal reflects the images of surrounding things. What is the mirror image? As an image it is real — it is a real reflection of the original tree existing in reality. But a tree is also represented in the image; this tree appears on the surface of the water, yet in such a way that it exists only through the medium of the reflections and not in reality. The image of the tree does not hide the surface of the water on which it appears as a reflection. The reflection of the tree is qua reflection, i.e. as a certain light-phenomenon, a real thing, and embraces the 'unreal' tree of the mirror world. That may sound too contrived – and yet my illustration is not far-fetched, but well known, something that we can see every day. The entire Platonic ontology, which has determined western philosophy to such a high degree, operates continually with the concept of the copy as a shadow and a reflection to interpret the structure of the world. Fink, Eugen, Ute Saine, and Thomas Saine. 1968. 'The Oasis of Happiness: Toward an Ontology of Play'. Yale French Studies, no. 41. Yale University Press: 19–30. p. 27f. 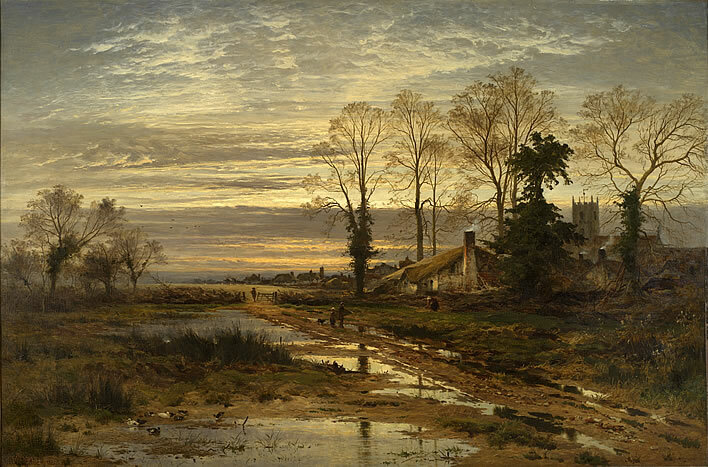 Benjamin Williams Leader RA (1831-1923), February Fill Dyke, 1881. Birmingham Museum and Art Gallery, UK. Accession Number: 1914P308, online page.